Facial recognition software is becoming more widely utilized as companies look to read consumers better and deliver products that we might need. For instance, there are cameras that can detect when people are smiling so that they always get the correct moment for a photo. And one coffee company is experimenting with the technology to deliver coffee to people when they need it the most. Douwe Egberts has designed a coffee machine equipped with facial recognition software that will dispense coffee to anyone it detects yawning. The machine was set up at Johannesburg’s O.R. Tambo International Airport as a marketing event for the Dutch coffee company earlier this year, dispensing free cups of coffee to tired travelers who yawned in front of the machine. 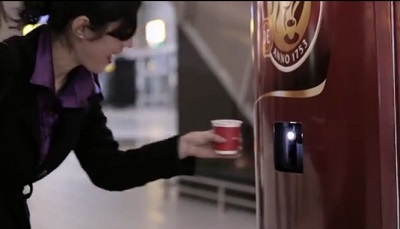 By the looks of the video below, people got a real kick out of the machine, so keep your eyes peeled for one the next time you’re traveling and in need of a little pick-me-up!